Fish oil promotes better health including arthritis and dyslexia. Fish oil has been proved to lower cholesterol levels and helps prevent illnesses as diverse as attention deficit, Parkinson's disease and Alzheimers. It's not just tasty, but also healthy. Fresh from salmon, mackerel, sardines and herring, all of which contain high levels of the healthy unsaturated fats EPA and DHA, is the way to enjoy it. They are called omega 3 essential fatty acids; there are actually three of them. ALA is the other one, from vegetable sources. You'll get strange neurological diseases, lose your marbles and your hyperactive kids will drive you crazy if your family doesn't get them in their diet. Fat gets a lot of bad press, but we cannot live without fat. Many neurotransmitters in the body, the nerves and brain itself are very rich in fat. But many folk still believe that, because they are fat, fat must be the villain. It may be part of the problem, but too many carbs with a high glycemic index are more likely to be the cause of their obesity. Glycemic Index and the Carbohydrate Count chart. But it's the saturated fats that we need to keep an eye on, but even that's not simple. For reasons that I won't go into here, it is my opinion that butter (a saturated fat), is healthier than margarine (an unsaturated fat). A report in the Archives of Neurology found that both people who consume a lot of saturated fat (that's butter, milk, cheese, eggs) and trans fatty acids (that's margarine) were twice as likely to develop Alzheimer's as people who avoid those fats in their diet. Is fish oil harmful ever? Yes, if it contains oxidised fatty acids, and that applies to many of the capsules of omega 3 that you may be buying. But it's almost impossible for you to tell unless you buy only from a reputable company. So too, if it contains large amounts of mercury. You wouldn't know. Also, if you have certain autoimmune diseases like sarcoidosis you should discuss taking fish oil with your doctor. However, let's be honest. The risks of not getting sufficient omega 3 in your diet are probably far greater than the small possibility that you may not be buying optimal fish oil. So do your homework. Scour the internet for the companies that produce the proven best fish oil, and don't go for that which is cheapest. There are crooks in every corner these days, ready to sell you snake oil; if price is the only consideration, beware. Fish oil promotes better general health including arthritis and dyslexia. Total fat in the diet should be limited though. A diet that is unbalanced towards fats, whether saturated or not, is certainly unhealthy, causing obesity (of course) and an increase in bowel cancers and cardio-vascular disease. But here comes the rub. Fats in the diet should also not be too low! There is very interesting research coming out now about the really serious neurological diseases like Motor Neuron Disease. Victims of this very serious disease have almost always been on a diet very high in carbohydrate, and simultaneously very low in fat. I fancy I see you throwing up your hands in horror. Well, what must you do? Lots of fat, or minimal fat?!!! Really, it's very complex, and we still haven't all the answers. My advice is, keep the balance in your diet. No stringent limiting of fats, even if you are really overweight, but stick to those that are known to be healty. For more about Motor Neuron disease, click here. (Scroll down). Tingling in arms and legs is a sure sign of a neurological system under stress. The benefits Omega 3 fish oil in salmon is that they keep the blood vessels clean and the fats in the blood in solution, maintaining healthy artery walls. It prevents the fatty plague that does such damage to the walls of your arteries. There are two essential omega-3 fatty acids in fish oil: DHA and EPA. Are there side effects fish oil? Not that we know of, if it's indeed fresh and free from oxidized fish oil. How much fish oil you should be taking is something of a vexed question. Rather too much than too little ... HOW MUCH FISH OIL ...? But definitely not more than three 1000 mg capsules per day. It is increases bleeding and the threat of haemorrhagic stroke. Hyaline cartilage is a vital subject for chiropractors; it's at the heart of the joint and vitally dependent on the omega 3 in fish oil. The alternative is premature arthritis. Fish-oil is also good for keeping the joints oiled. Granny wasn't quite so stupid as we thought with her insistence on cod liver oil. The fish oil children connection is now very well established. It is healthy for the joints and arthritis, hence our interest in chiropractic in promoting more fish in the diet. For strong bones, this best calcium for osteoporosis is worth a read; don't wait for the first fracture; then it's too late. it's vital for the prevention of arthritis of our joints and general health that we either eat fatty fish twice a week, or take fish oil capsules, or both; it raises the omega-3. Anti inflammatory chili too has an important roll to play in the management of red hot joints. EPA and DHA, those two essential fatty acids in fatty fish, play an essential part in the development of the brain. 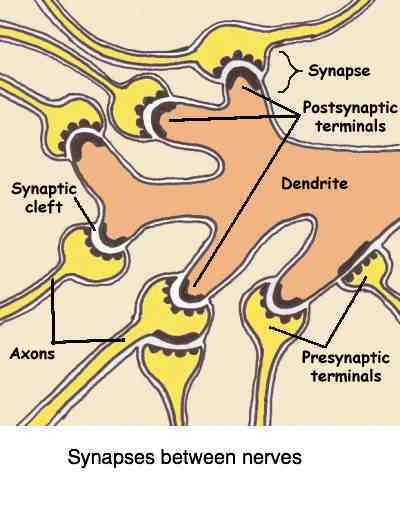 Moreover, because of the part they play in neurotransmitters which carry the information from the 'dendrite' of one nerve to the 'axon' of the next nerve, they have been shown to help with memory and concentration. Say from the researchers from the Dept of Psychiatry, University of Pittsburg: "Existing evidence links greater dietary intake of fish and Omega-3 to better early brain development and lowered risk of cognitive disorders in late life. Higher DHA (an Omega-3) was related to better performance on tests of nonverbal reasoning and mental flexibility, working memory, and vocabulary." 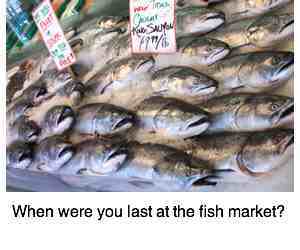 So, get out to the Fishmonger, and let's eat more fatty fish. Better and cheaper than taking salmon oil capsules, but they too do have a place in your pill box. It's all a question of balance. If you are eating large quantities of fruit, salad and veggies, then within reason, you can enjoy your proteins and fats. But do stay away from margarines with their transfats, and eat butter only in moderation. Do get your blood profile checked. Should you suffer from Hypercholesterolemia, a rare blood disorder, then even a healthy diet won't keep your cholesterol within normal limits. Better to be sure if you have a family history of heart disease. Fish oil health benefits ... make up your own fish bouillon. Vegetarian? It may come as a surprise, but mother's milk is very high in fat, nearly a half of which is saturated, considerably higher than most cow's milk, which has more protein. The reason is simple: it's the human infant brain that grows so fast in comparison with the calf's body . Brain tissue is make up largely of fat, and it's important that the developing brain be fed adequate fat. If you want a baby with a big brain, feed it mother's milk. If you want a baby with a big body ... you get the drift. Large surveys have clearly shown that breast fed babies have significantly higher IQs. It is extremely important that the lacting mother does not go on a low fat diet, as this will impede the development of her baby's brain. This is not the time to go on extreme diet. Two important fats, lauric and capric acid, in mother's milk have been found to have anti-microbial properties. This can be boosted by drinking coconut oil which is rich in fat. To summarise, eating more deep water fish that are rich in Omega-3 fish-oil helps brain development and gives protection against infections. Fish-oil for children, butternut soup for children, in the beginning via mother's milk, and then simply by eating salmon and the heathy fish bouillon that we rave about at Chiropractic Help is the way to go. And of course delic butternut soup, rich in Omega-3. Interesting research done in the United Kingdom with children with behavioural problems has shown that a mixture of fish-oil and Evening Primrose Oil has amazing benefits for children suffering from ADHD and dyslexia. Fresh fish-oil for kids is vital. Omega-3 is a PUFA; a poly unsaturated fatty acid. There are three important "essential" omega 3 fatty acids that you can only obtain by eating foods rich in them; like fish oil. They are "essential"; without them growth will be stunted. Alpha-linolenic acid (ALA) (good stuff, found in seeds and nuts, but not proven to reduce heart disease like EPA and DHA do). Forget the long names, but start looking for foods rich in ALA, and particularly EPA and DHA. It's these latter two (EPA and DHA) that have been scientifically proven to reduce heart disease, blood vessel disease, reduce blood pressure, memory and behavioural problems and attention deficit in children, and depression. Omega-3 is also recommended by the American macular degeneration foundation along with lutein and zeaxanthin for the prevention of MD and cataracts. You can find more information at our zeaxanthin macular degenation page. Pecans nutrition ... when did you last crack a nut? Sorry, this stuff is complex, but you'll keep bumping up against these terms, and if you are interested, you'll need to understand them. You'll begin to understand why food scientists are now recommending we eat from as wide a selection of foods as possible, to get all these nutritional substances in the body. Taking pills is not the same. If you have the purslane plant in your garden remember it's the richest source from green leaves. Linolenic and linoleic acids are both PUFAs; watch it, they're not the same. Alpha-linolenic acid. (ALA) Yes, that's the Omega-3 above, found richly in flaxseed. Gamma-linolenic acid. That's the Omega-6. All three are "essential" - unless you get them in your diet you will get neurological and other diseases. So will your children. The omega-6 /omega-3 balance is vitally important in preventing inflammation in the diet. Now the important bit: People who eat a diet with a ratio of Omega-6 to Omega-3 as close to 1 as possible (equal quantities) are the ones who have the least inflammation in their bodies. But the Western diet is hopelessly overbalanced in favour of Omega-6 from vegetable oils like sunflower oil with a ratio often of 30/1 and even 50/1. Safflower oil remains controversial. It's high in omega-3 but highly processed, totally genetically modified, and containing a toxic substance. Google it; the scientific community is divided on it's health benefits. There are of course many ways to cook salmon and mackerel; both are found in cold water, and are very rich in omega-3 fish oil; it's all about food and inflammation. People will argue until the cows come home as to whether you should eat more fatty fish, or take the soft gel capsules. Probably, in my opinion, it's best to do both. Provided you can get high quality salmon oil that's not oxidised (like many are, buyer beware). Here are two of my favourite recipes. The first, ways to cook salmon, is particularly for people who can't stand the taste of fish, but know they need the oil. A salmon and broccoli soup recipe, made in a jiffy. Absolutely loaded with anti-oxidants and you can barely taste the fish. Smoked mackerel recipes is the whole mackerel. Head, bones, skin, fins, absolutely delicious, and the cheapest fatty fish. Just peels right of the bone. And you can certainly taste the fish. Yum! You'll also be able to feel the difference in any varicose veins in legs. Your weight; are you worried about too much fat? Concerned about your weight, with these recommendations about fatty fish? Yes, it's complex. But cutting out all the fat in your diet is extremely unhealthy - your brain, your memory, your nerves, your joints will all suffer. Eat the recommended amounts of the healthy fats, and keep the butter, margarine and animal fats to a minimum. Don't forget the olive oil benefits too. Why margarine? All the adverts claim it's heart-friendly. Maybe, but it's not nerve-friendly because it's one of the "hydrogenated foods". Hydrogenated foods ... the bad stuff. There's no doubt concerning the benefit of fatty fish; salmon, mackerel, tuna, herring, lake trout. But some research continues to cast doubt on taking fish oil capsules, quite apart from the oxidation and mercury issues. Amongst the strongest research is the so called meta analysis; a pooling together of numerous trials. In a recent meta analysis of 20 different studies, researchers report in JAMA, after evaluating the results of nearly 70,000 people, there was no significant benefit on the incidence of heart attack, stroke and sudden death, compared to a placebo. As always, eating whole foods for their nutrients is far more beneficial than than swallowing pills containing the vitamins, minerals and fatty acids in that fish, for example. Oranges are better than OJ and freshly ground flaxseed is better than the oil. Enjoying cold water fish is not only tastier and cheaper but more beneficial that fish oil capsules. Pickling olives is so easy if you buy a large tin; then you have all the complementary anti inflammatory effects of these olive oil benefits. Return from fish oil to early symptoms of arthritis. Chiropractor Somerset West, Strand and Swellendam in South Africa. Lutein macular degeneration is another link concerned about their eyes; that's all of us. Best evidence suggests that we should be getting omega-3 from both fatty fish (EPA and DHA) and seeds, avocados and nuts (ALA). And we should rather be eating whole foods with these nutritious fatty acids, rather than swallowing large amounts in pill form. Is fish-oil harmful and what are the health benefits? You can read all about it in the fascinating research done on heart stoke diabetes.